There is a consignment/antique shop on the grounds where the Huntington Sheep to Shawl Festival is held. It is run by Historical Society volunteers and we call it “The Old Ladies”. 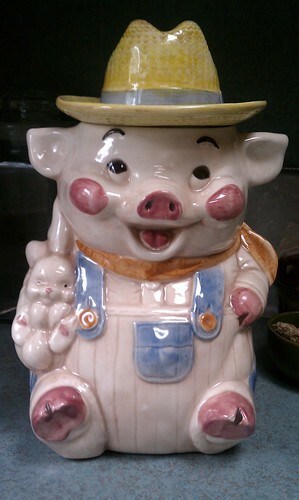 hey, where did you get that cool new pig cookie jar? 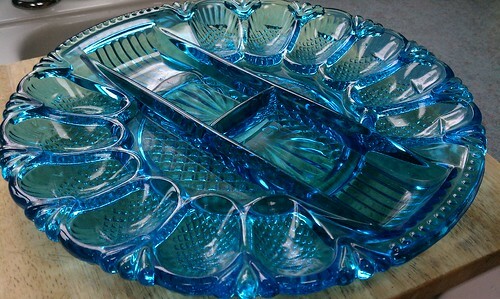 How about that fantastic new deviled egg serving plate? They have a system for tracking items and making sales that is based on handwritten tags that they either peel off of the item when making the sale or they re-write the tag. Between the failing eyesight and the shaky hands this is quite an endeavor made worse by tags that won’t unpeel! You have to really want whatever it is you are buying. If you try to help or make any suggestions whatsoever you will learn that this is their method and they will not deviate. I can respect that and I learned years ago to stand there quietly and feel very young (even though I’m not!). The pig had to come home with me. That goes without saying. The deviled egg plate….. Do you know that I have never made deviled eggs? Despite this I have been wanting one of these plates for sometime! Any killer recipes to share? Any suggestions for what to serve in that center section? There are so, so many great deviled egg recipes. Do you like horseradish? mustard? pickles? Don’t forget the paprika whatever you do. In the center put sweet pickles and black olives. That’s how my mom did it!! I just mash up the yolk with some mayonnaise ’til I like how it looks, spoon it into the white, and sprinkle with paprika — simple and traditional! I vote for pickles & olives in the center, also.